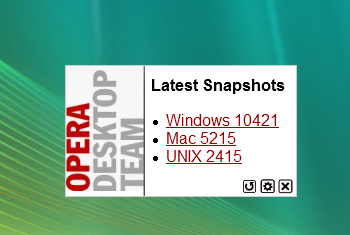 Opera Desktop Team – Latest Snapshots lets you keep track of the snapshots builds that are available from the Desktop Team blog. This widget (by default) reloads the versions every 5 minutes. The interval can be set to any thing you want and updates can be performed manually by pressing the “reload” icon. Added control icons to widget (reload, configure, close). Added config panel to widget and back-end code. Added loading icon so updates have a visual signal. Added version checking to allow for notifications in the future. The current build number and platform are parsed and a “New” flag is displayed in the widget if there is a newer version. *Note: If the Desktop Team (as they currently do) have listed only platforms and left out the build numbers like they do for final releases or Betas then the version checking is skipped and only your current build information is displayed in the widget. No update notifications will be parsed and signaled. Added a “New” icon to the set to be displayed when there is a newer build available. Added the current build and platform that the user is running to the bottom of the widget (as already stated above). Adjusted the widget dimensions in the config file so no space is wasted. It also makes the widget look a little better in UNIX/Linux when the graphics won’t allow transparency. Added showNotification() support so a small popup notifies the user that an update is available the first time it is noticed. Fixed a small word change that the Desktop Team Blog site changed, causing this widget to break. Updated the preview.png image packaged with the widget. Fixed the way the snapshot build numbers are detected. Updated the Opera icon and listed various resolutions. UNIX is now listed as Unix. I’m thinking that it would be nice to have a current build number in place in the widget for an easier way to tell if you need to upgrade. So I’ll look into adding that for build v1.1 v1.2. If you have any other suggestions or comments please post away!